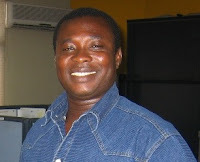 Dela Black Bobobee is a Ghanaian writer. He was educated in Ghana and Nigeria. He holds a B.A (Hon’s) English, and a Masters of International Law and Diplomacy (MILD), both from the University of Lagos. He is currently studying for an MBA degree in Management. His works have received much commendations, recognition and had won him several awards. His hobbies are writing, studying foreign languages, and cinematography. He is a Life Member of the prolific Theatre 15 (University of Lagos), Abuja Literary Society (ALS), and the Actors Guild of Nigeria (AGN). I started writing poetry when I was in Form One in what was then Middle School in Ghana. That was in 1978 when I was about 13 years old. It is all coming back to me now. I remember that I usually walked away from the raucous crowd at school during break time to a tiny forest behind our school. It was a very quiet spot I personally named the "Tranquil Woods." That incidentally became the title of the first serious poem that I wrote. I silently observed the quiet nature of the surroundings in contrast to the noisy background of the nearby school. I observed and listened to the wind passing through the stirring leaves on the trees and how it gently swayed the colourful birds on the branches which bowed listlessly in obeisance to the wind’s invisible passage. I would be very glad to showcase that particular poem some day for you to see what those powerful feelings evoked in me at that tender age, and the impact of the lucid descriptive power that was generated. That was a long time ago. I started writing more serious poems much later in life and published many in literary journals in the University and on many sites and blogs on the internet. To me, poetry is the rhythm of life itself, its symmetry is intrinsically manifested in our five senses: visual, auditory, tactile, kinetic and gustatory imageries. There is poetry in the rhythmic sound of the broom sweeping the bare floor at dawn in a colourful rhythmic pattern, there is rhythm in the sound of the pestle and mortar that is generated when pounding fufu, and the spurting sound of hot soup smouldering on the earthenware hearth fireside. There is also a silent rhythm in our heartbeats as we write our thoughts on paper for others to ponder over and argue about. There used to be a publication called “Talent For Tomorrow” which published poems selected from submissions from Teacher Training Colleges in Ghana. I read these collections with relish, and the gnawing hunger for more verse created a vacuum in me that compelled me to put my own words on paper. My favourite poets are Dennis Brutus, George Kofi Awoonor Williams, Wole Soyinka, William Shakespeare, Robert Frost, Emily Dickinson and a few other African poets. The writers do not matter, what matters most is the message the poetry has for humanity. But to be frank, my greatest inspiration and influence comes from the poetic King David, and the poetic nature of the Psalms he wrote. In those days, while young guys were busily searching dictionaries for sugar-coated words and highly exaggerated vocabulary in their bid to bamboozle and woe prospective girlfriends, I was seeking for help elsewhere. I remember writing a poetic love letter to a girl I met in Accra Girls’ High School while on holidays, not with the aid of a dictionary but by borrowing poetic stanzas from the book of Psalms. May God forgive me, but I couldn’t help the ardent poetic flow of the verses that spill out naturally with deeply fervent and powerful emotional feelings. I guess that is where poetry originates from. From the deep recesses of the soul. A poet is a wordsmith with prophetic visions of pent-up emotions alloyed in the subliminal vaults that is made explicit on the grim tufts of reality. To me, a poet has four darts in his arrow; to say what happens in the world, to critique what happens, to imagine new things, and to create a charming entity. Above all these things, I want my poetry not to only criticise but to also proffer solutions to the myriad problems facing humanity today. I have started a poetic movement called "Millennium School of Poetry," which is an attempt to paint a representative picture of what poetry should reflect mostly in the present unique circumstances of the world. It deals with critical global issues and draws heavily from the colour reflection of our present society. I have also carved a niche for myself in Healing Poetry and it is yielding amazing results. My poetry revisits the past, the present and the future to fashion out a just path of introspective in order to forestall any silly and ugly human recurrence of woes. I want my poetry to be a reviewer of mores, to proffer solutions through witty tasselled verses purged in the crucible of conscience through iconoclastic lens of unbiased aesthetics. My poetry will live in the heart of humanity. I have already started seeing encouraging results. 4. How has living in Nigeria affected your view of your homeland? Yes, that is a very interesting question. My living in Nigeria has greatly affected my view of my homeland in many diverse ways. I was born and bred in Ghana but was educated in Ghana and Nigeria, and so I guess I have an ample basis for comparisons to assess my candid view of my homeland. Presently, most Nigerians have a lot of admiration for Ghana’s steady economic, social and academic progress. Nigerians are now always berating their country and comparing it to Ghana, which they treat in glowing terms. “Oh just look at the wonderful works that small Ghana is doing politically.” They are agitating for Nigeria authorities to learn a lot of lessons from the Ghanaian electoral process. Nigerians are relocating to Ghana on a daily basis. What they say lures them to Ghana, among other things, are political stability, safety of life and property, good governance, uninterrupted power supply, investment friendly economy and the hospitality and friendliness of Ghanaians. There is a shopping bag here in Nigeria they used to call “Ghana Must Go” which was apparently coined during the mass deportation of foreigners from Nigeria. But nowadays, I hear some Nigerians calling it “Ghana Must Stay”! When I hear foreigners speak of Ghana in pleasant terms like this, it makes me very proud and it evokes much deeper patriotism in me for my homeland. That is why I feel very bad when I read the bad articles some of our own Ghanaians are writing on the internet about unjustified and less constructive criticism aimed at generating hateful tribal sentiments and political brouhaha. There should be no such thing as power politics and power blocs in the Ghanaian polity, but unfortunately, that is what I see every day. When you see others seeing your own homeland in such positive lights you would certainly know better how to direct your vituperations constructively and find more progressive avenues to show your genuine patriotism. That is what I like about One Ghana, One Voice and what motivated me to join you brilliant chaps. The blend of elements of Ghana and Nigeria in me was at first seen in a steady flow of both internal and external conflicts. I stubbornly refused to compromise my “Ghanaian Queens English” to speak Nigerian English. Everywhere I go, once I open my mouth to speak all heads would turn in my direction with unconcealed admiration. “Are you a Ghanaian?” My answer is naturally always “Yes, I am.” When I speak, I hear Nigerians say, “Phone!”, pronounced “Fonne”, from the stub of phone-tics. But when I realized that the English language itself is like an orange and the various regional dialects are the different strands of the same whole, I no longer bother that much and now consider it as a means to be heard and understood in a borrowed language. In a diglossia language contact situation we see regionalism in British English, American English, Ghanaian English, Nigeria English, Irish English, Scottish English, Indian English, Singaporean, Jamaican etc. But I tell you, we are all one, and our uniqueness lies not in our disparity but in our unity in diversity. 5. Could you tell us more about the Abuja Literary Society? What influence has being a member had on your life and writing? Indeed Nigeria has a very long historical list of talented literary brains. Starting from the old school African Writers’ Series publication editor Chinua Achebe, we know how many Nigerian writers who have contributed to immensely to African literature. There is still a very vibrant breed of new generation writers sprouting everywhere in Nigeria. I joined the Abuja Literary Society (ALS) in 2006. The ALS is the brainchild of some a very brilliant Nigerian literary artists. There is no how my joining this group of talented writers would not influence my life and my writing. My first degree in the University of Lagos was English but apart from my academic knowledge, my joining the ALS has greatly enriched my writing and general perception of creative writing in general. It is even more interesting to know that ALS has started plans to form a Ghanaian version of ALS right here in Accra to be called Accra Literary Society Ghana Chapter. It is very funny to notice the coincidence in the similarity of the acronym, ALS. Mr. Victor Anoluefo (the Quill Master), who is also a personal friend of mine told me this when he found out I am a Ghanaian. He is a very versatile individual. The ALS was formed in August 1999 by Victor Anoluefo (the Quill Master), Ken Ike-Okere (Slam Master) and Dr. Ike Anya (now based in Lagos). It is a forum whereby those with creative talents come together to express their creativity. From one reading in a month, the Abuja Literary Society engages in six readings a month. Ordinarily, it was an open-microphone reading, but now they have diversified into different readings. Among others, the third Friday of every month is dedicated to short stories and the first Saturday of the month is dedicated to its Book Club. It has a host of activities that include Abuja poetry slam, lectures on various topics delivered by well resourced persons, and reading sessions. After each reading, the writers would discuss the suitability or otherwise of the writer’s themes, diction, mechanical accuracy, form, imagery and other literary technique. In most cases, the authors accepted the criticisms in good fate. Certainly the impact of the critical reading no doubt has a very positive impact on the writing of members who have read their works. The association lives up to its responsibility to generate and sustain literary culture in Abuja. ALS and other writers' associations like the Abuja chapter of the Association of Nigerian Authors (ANA) are rapidly shaping Abuja into a global creative city. My joining ALS has greatly influenced if not my writing then my general perception of art in general.